The French Ministry of Immigration have said that the ship in the foreground is the Orohena, an auxiliary schooner of 532 tons, making a weekly run between Tahiti and outlying islands, and the vessel shown being launched is the auxiliary schooner Moana which served the Tuamotu Islands but is no longer in existence. The Tahitian name " Moana " means "vastness of the waters" and would appear to be a popular name for sailing vessels. It was given to the cutter owned by Bernard Gorsky, the famous French frogman, author and voyager in which he made a round-the-world trip some years ago. 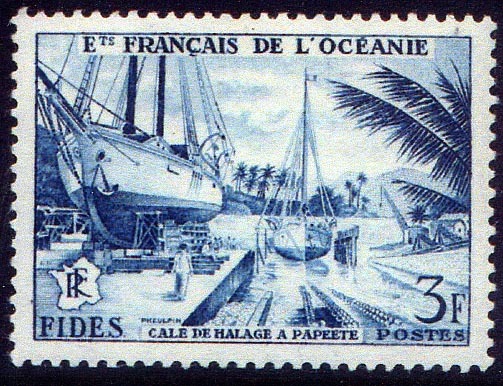 Two vessels are depict on this stamp issued in 1956 by French Oceanic Settlements, the ship on the slip-way is the OROHENA and the vessel just launched is the MOANA, according the French Ministry of Immigration. Most probably she were there for there overhaul and repair. OROHENA was built under yard No 247as a wooden coastal freighter supply ship by Northwestern Ship-building, South Bellingham, WA for the USA Army. Launched as the FS 247. Tonnage 532 gross tons, dim. 148 x 33 x 17ft. Powered by a 5-cyl diesel engine, 875 hp. 1947 Bought by the Govt. 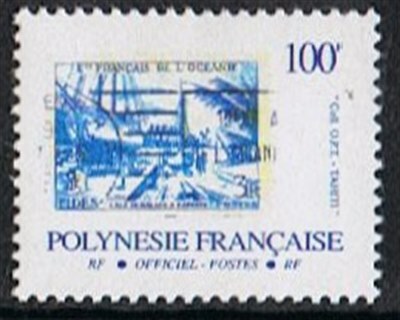 des Establissements Francais de l’Oceanie and renamed in OROHENA most probably named after mount Orohena, Tahiti. Used as an auxiliary schooner making weekly runs between Tahiti and outlying islands. 1953 Sold to A. Blouin and renamed VAIATEA. 24 November 1977 sank in a lagoon near Papeete, Tahiti. MOANA was built as a wooden vessel by Stone & Van Bergen for Comerciale de L’Oceanie, Papeete, Tahiti. Tonnage161 gross, 152 net, dim. 114.1 x 28.8 x 9.1ft. Used as a inter island trader for the Tuamotu group. She is mentioned in Lloyds Register until 1945 but not more in Lloyds 1955/56. Oceanic Settlements 1956 3f sg215, scott181. French Polynesia 1993 sgO787, scott O24.